Volunteers have created a cascade of poppies on St Lawrence Chapel in Warminster - each one includes the name of a fallen soldier. The tribute was inspired by the ceramic poppy installation at the Tower of London in 2014. Each one of these poppies however has been lovingly knitted or crocheted by an army of volunteers in the Wiltshire town. The display of some 4,000 flowers commemorates British and Commonwealth soldiers who were killed during World War One. The display of poppies, organised by the garrison town's Poppy Appeal organiser, Lesley Fudge is not confined to the church. 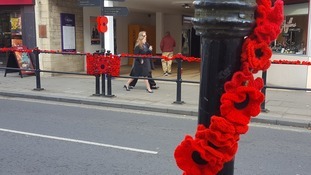 The whole town has been 'yarn-bombed' in memory of the servicemen and women lost in conflict. Poppies are draped all over the town's memorial bench with the names of all the soldiers who lost their lives in Afghanistan sewn into them. Most of the poppies are made from synthetic wool and will keep their colour. It means the tribute can be put up every year until the centenary of the end of World War I in 2018.